Currently viewing the category: "Recent News"
The Thurmont area is perfect for growing grapes that then can be turned into fine wines, and Alicja and Voytek Fizyta have the awards to prove it. 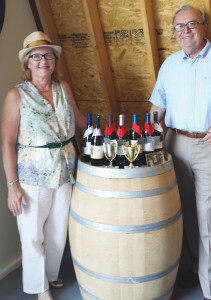 Over the past five years, the wines of Catoctin Breeze Winery have earned thirty awards at shows like the Atlantic Seaboard Wine Association Wine Competition and Winemasters Choice Competition. The soil also contains limestone and other minerals. These minerals are absorbed by the grapes and give them a unique taste. The stony soil also forces the grapevines to send their roots deep into the ground in search of water, creating a stress on the vines that produces grapes of richer flavor. Alicja and her husband Voytek lived in Montgomery County, but after their children grew up and moved out on their own, they decided to start making wine. “We decided that we wanted a change of lifestyle, and we had always enjoyed drinking wine with friends,” Alicja said. They started taking classes and reading books about wine making. They established Catoctin Breeze Vineyard in 2010 in Thurmont when they planted two acres of grapevines. They made their first harvest in 2012. They have also planted another two acres of vines, which were harvested this year for the first time. They now have about 8,000 vines growing. “We also have a sister vineyard in St. Mary’s County that grows grapes that we don’t have here,” said Alicja. Catoctin Breeze Winery expects to bottle between 1,200 and 1,500 cases of varietal wines, blended wines, and meads this year under their three labels. The Butterfly Series offers cabernet franc, chardonnay, Syrah, rose, and viognier wines. The Musical Series offers chardonnay, Riesling, Vidal Blanc, Bordeaux blend, petit verdot, and merlot. The Mead Series offers amber, dolce vita, and honeymoon. It’s a recipe that is paying off as appreciation of Catoctin Breeze’s unique wines grows. In 2011, the vineyard won four awards for its wines. This year, Catoctin Breeze Winery earned eleven awards, including a Best in Show-Reds Award at the Winemasters Choice Competition for its 2013 Adagio Petit Verdot. While running a vineyard has turned out to be a lot more work for the Fizytas than they expected, they very much enjoy meeting the people who come to enjoy their wines. “We want to make good wine and meet new people,” Voytek said. Catoctin Breeze is currently building a permanent tasting room to accommodate its growth. You can visit the winery for tastings, tours, and the purchase of the wines. You can also purchase the wines online or at local retailers. Wine Tasting and Vineyard Tours are Monday through Thursday, 10:00 a.m.-3:00 p.m.; Friday, 10:00 a.m.-3:00 p.m. and 5:00-8:30 p.m.; and Saturday and Sunday, 12:00-5:00 p.m.
Catoctin Breeze Vineyard & Winery is located at 15010 Roddy Road in Thurmont. Contact them at 240-449-0677 or by email at info@catoctinbreeze.com. Young Betty Jean Hixen was raised in a family of Polish and Irish descent, who were coal miners in Jordan, West Virginia. Just three miles away, her future husband, William (Bill) Meredith, lived with his family of Welsh and Irish ancestry. They were farmers. The two were destined to love, and met when she was a freshman and he was a senior, on the school bus ride to East Fairmont High School. Betty joked, “He said it was love at first sight!” Bill parried, “It was very sneaky, if it was.” She invited him to her 14th birthday party, to which he brought her a gift of Whitman’s Samplers candy. They liked each other and started dating that spring. Bill was scheduled to attend college at Fairmont State, located in the same town, so they continued to see each other. Bill had a pony colt that he sold to get money to buy a ring, and he proposed to her at Christmas, 1954. He doesn’t think she was surprised. They married at their local Presbyterian Church, amid 100 degree heat on August 20, 1955, after Bill had completed his final year at Fairmont State. Betty started Business college that fall. Graduating with a degree in Biology Education from Fairmont State College, Bill thought he would, “…get a job as a high school teacher and that would be that.” But that spring, a new professor at Fairmont recommended that Bill go to graduate school at West Virginia University (WVU) for free to serve an assistantship there. While at West Virginia University, their first child arrived—a girl they named Melinda. Soon after, the assistantship came to an end and Bill had no idea how or where to apply for a job. His thesis advisor had heard about a vacancy at Mount St. Mary’s College. Bill applied and was hired right on the spot in 1957. At Mount St. Mary’s, Bill was an instructor in biology. He said, “They have ranks, and instructor is the lowest, and that’s what I was.” Here, they had two more children, Michael and Fred. While Bill attended the University of Maryland to obtain his doctorate, Betty raised the kids. The couple then moved to Emmitsburg and settled into the town. Family trips usually revolved around National Science Foundation (NSF) grant-funded studies. The family went to Colorado for an ecology study, Arizona for a desert biology study, and North Carolina for genetics. The whole family would go, and they met lots of nice people and kept in touch with them. Bill received the Sears Award for Excellence in Teaching in 1990. This was a prestigious national accolade. After forty-one years at Mount St. Mary’s, he retired. “It was my first and only job. I ended up as the Dean of Undergraduate Studies.” He retired in 1998. Bill received another accolade when he was invited to speak at Mount St. Mary’s commencement after he retired—this was the first time since the 19th Century a faculty member was asked to speak. On the home front, the Merediths have raised a garden since the summer of 1954. Betty started entering the Thurmont and Emmitsburg Community Show with vegetables and baked goods, and won many ribbons. She said, “I could paper this whole house with the award ribbons. It was fun!” Unfortunately, she suffered a broken hip a few years ago and couldn’t enter anymore. Bill has written his monthly column entitled “The Retired Ecologist” in local newspapers since the 1990s. The column has appeared in the former Emmitsburg Dispatch when Bo Cadle started it, then for the Emmitsburg Dispatch when Ray and Jennifer Buccheister ran it, in the short-lived New Emmitsburg Chronicle, and now, it appears in the Emmitsburg News Journal. About the column, he said, “I hope the reader will know things about ecology by reading that they didn’t realize they learned.” September’s issue will include his 185th column, featuring an interesting story about his and Betty’s wedding and marriage. Their three children have children of their own now. Melinda and Fred both retired from Verizon, and Mike’s a jeweler. The three youngest of six grandchildren are in college, while a computer specialist, an international economics graduate, and an events coordinator round out the group. 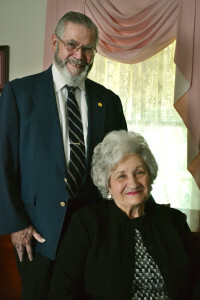 The family gathered at their home on August 23 to celebrate their 60th anniversary. They’ve led an interesting life together, impacting many by imparting knowledge and nurturing growth. Bill and Betty, we wish you many more years of happiness! CPT David Lee Burrier, son of Lonnie and Barbara Burrier of Thurmont, recently became Company Commander of the HHC, 127th Engineer Battalion, 1st Brigade Combat Team, and 82nd Airborne at Fort Bragg in Fayetteville, North Carolina. CPT Burrier was a 2004 graduate of Catoctin High School, and a 2008 graduate of The Citadel in Charleston, South Carolina, where he earned a Bachelors Degree in Civil Engineering, attended Airborne School, and then commissioned through ROTC. After graduation from The Citadel, CPT Burrier attended the Basic Officer Leader Course II at Fort Benning, Georgia, the Engineer Officer Basic Course at Fort Leonard Wood, Missouri. CPT Burrier was first assigned to the 27th EN BN, 20th EN BDE at Fort Bragg, where he served as a Platoon Leader in the 264th Route Clearance Company and deployed to Afghanistan in 2010. During the deployment, CPT Burrier also served as the Executive Officer for the 161st Engineer Support Company, with which he redeployed back to Fort Bragg. In May of 2011, CPT Burrier took over as the Olmsted Division Executive Officer, Louisville District USACE, stationed in Paducah, Kentucky. During his time in the Louisville District, CPT Burrier earned his Professional Engineering Degree in the state of Kentucky. After serving as the Executive Officer, CPT Burrier attended the Engineer Captains Career Course at Fort Leonard Wood, Missouri. Upon reporting to Fort Bragg in 2013, CPT Burrier served as the Assistant Brigade Engineer for the 3rd BCT, 82nd Airborne Division. In 2014, CPT Burrier served as the Assistant Operations Officer for the 307th AEB, 3 BCT, 82nd Airborne Division. CPT Burrier’s awards and decorations include the Senior Parachutist Bade, Combat Action Badge, Bronze Star, Purple Heart, Army Commendation Medal, Meritorious Unit Commendation, and Senior Parachutist Badge. CPT Burrier is married to his wife, Hunter, for five years, has one son, Mason, and resides in Raeford, North Carolina. 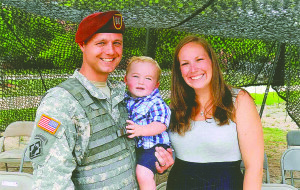 CPT David Lee Burrier is pictured with his wife, Hunter, and his son, Mason. Jeremy Murphy (pictured right) was born and raised in Emmitsburg, graduating from Catoctin High in 1998. 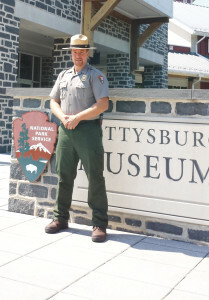 He visited both Catoctin Mountain Park and Gettysburg National Military Park on field trips and summer trips, never realizing that he would grow up to become the chief law enforcement officer for the Gettysburg National Military Park and Eisenhower National Historic Site. Murphy, who has been with the National Park Service (NPS) for fourteen years, took over the duties of planning, direction, and execution of programs dealing with law enforcement and resource protection, emergency services, and safety for the park rangers. “I’m happy to be here,” Murphy said. “My family lives in the immediate area, and my wife’s family is from Taneytown. Previous to coming to Gettysburg, Murphy was chief ranger for the Visitor Protection and Resource Education Division at Monocacy National Battlefield in Frederick. He also served in law-enforcement ranger positions at Catoctin Mountain Park, Harpers Ferry National Historic Park, and Delaware Water Gap NRA. Prior to law enforcement, he worked for the resource management division and the maintenance division at Catoctin Mountain Park. “I actually went to school and studied wildlife management and then I shifted to forestry,” Murphy said. When he graduated from Penn State, Murphy originally tried to get a job with the Pennsylvania Forestry Service, but was turned down because he didn’t live in Pennsylvania at the time. He had worked as a trail crew member for the NPS, which was seasonal work. He tried to get a job with NPS on a permanent basis through the NPS intake program, but the organization wasn’t hiring biologists. He did find out that they were hiring law-enforcement rangers. He applied and was hired. He has kept his work sites near his hometown, which has worked out well. He was involved with the sesquicentennial events for the Civil War sites in the area and the bicentennial events at Fort McHenry in Baltimore. When he was working at Catoctin Mountain Park, he even met President Bush. He is currently the planning section chief for the planned Papal visit this month to Independence National Historical Park. “Each park I’ve been at has moments for me that stand out,” Murphy said. His favorite park, however, is the Delaware Water Gap Park. Murphy met his wife, Erin, through a mutual friend while he was working at Harpers Ferry National Military Park. They live in Fairfield, Pennsylvania, with their three children—Wyatt, Ayla, and Tristan. The Thurmont Thespians are proud to announce auditions for their fall show, God’s Favorite, a comedy by Neil Simon and directed by Matthew Bannister. Auditions will be held at St. John’s Lutheran Church, located on 15 N. Church Street in Thurmont, on Tuesday, September 1, at 7:00 p.m. and Wednesday, September 2, at 4:00 p.m. The audition will consist of cold reads from the script and some improvisation scenarios. God’s Favorite is based on the biblical story of Job and takes place in a Long Island mansion. One night, a messenger from God, Sidney Lipton (with a big G on his sweatshirt) arrives and, as in the biblical story, goes through all manner of temptations to get Joe Benjamin to renounce God. When he refuses, he is visited by all the afflictions imaginable. He stands firm and the messenger has to admit defeat. The household consists of a pious, God-fearing tycoon named Joe Benjamin and his family: a long-suffering wife, Rose; a prodigal son, David; a pair of kooky twins, Ben and Sarah; and the maid and butler, Mady and Morris. All roles are open. For more information, please contact Matt Bannister at 240-626-8178 or by email MattJB75@outlook.com. Frederick area film maker, Conrad Weaver of ConjoStudios, LLC, just announced that his 2014 documentary film, The Great American Wheat Harvest has been nominated for an Emmy Award! On Thursday, August 7, 2015, the Mid-America Chapter of National Academy of Television Arts and Sciences revealed the nominees for the 2015 Regional Emmy Awards, and The Great American Wheat Harvest was nominated in the documentary-cultural category. The film aired on WQPT (Quad Cities PBS) this past February and consequently qualified to be submitted for the nomination. As one of nineteen regional chapters of the National Academy of Television Arts and Sciences, the Mid-America Chapter is the standard-bearer for excellence in the television broadcasting industry and the gatekeepers of the prestigious regional Emmy Awards. Mid-America represents the most experienced and talented television professionals from all disciplines of the industry in the region. “It’s really an honor to be nominated for an Emmy Award; it’s the culmination of a lot of hard work and persistence in getting our film to an audience who needs to see it. This nomination is also a tribute to the farmers and harvesters who work hard, year in and year out, to bring food to our tables,” said Weaver. The 39th Mid-America Emmy Gala will be held on Saturday, October 3, 2015, at the Marriott St. Louis Grand Hotel in St. Louis, Missouri, and Weaver hopes to come home with the golden statue. Weaver is looking for more opportunities to air the film. Any television station programming director who would like to feature The Great American Wheat Harvest, should contact him at 301-606-7794, or email at Conrad@conjostudios.com or on Twitter: @conjostudios. The film is also available on DVD through the website: www.GreatAmericanWheatHarvest.com. Weaver and his company, along with another Frederick company, Archai media, are currently working on another documentary film, Thirsty Land. This film will tell the story about the drought in the American west and its impact on agriculture and communities. Learn more at www.thirstylandmovie.com. Hometown Author, Allison B. Hanson, will be signing books on Saturday, September 12, 2015, from 11:00 a.m.-1:00 p.m., at the Blue Ridge Summit Free Library, located at 15055 Summit Plaza in Blue Ridge Summit, Pennsylvania. Come out to meet the author as she introduces the first book in the Blue Ridge Romance Series, When Least Expected. Visit her website at www.allisonbhanson.com. The 9th Annual Barnstormers Tour and Plein Air Paint-Out was held on Saturday, June 13, 2015. Local artist Rebecca Pearl was one of thirty-five artists to participate. The event was sponsored by the Frederick County Landmarks Foundation as a fundraiser to support the preservation of barns in the Frederick County area. The day’s activities gave attention to these beautiful old structures and their importance to our agricultural heritage. 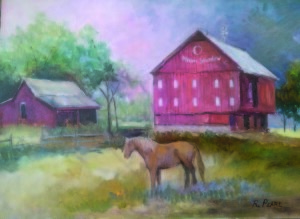 The day had three components: a ticketed barn tour for the general public; an art contest, show, and sale; and various educational demonstrations and displays. Tickets included a guide book and map. This year, the barns of the scenic Sugarloaf Mountain Region were featured. Artists were sent to various farms, where they each determined a perspective to draw or paint. Rebecca was randomly assigned to paint Moon Shadow Farm, located just over the Frederick County border in Montgomery County. She had never been to that location before. “It was quiet and gorgeous. It was hot and humid. It usually is. That’s part of the challenge of plein aire (outdoor) painting. You put up with the changing light, the weather, and people talking to you,” said Rebecca. She walked around for a while when she arrived, looked at a lot of different perspectives and lighting, and finally settled into a fenced pasture and set up. She painted until about 2:30 p.m. and then gathered her supplies and moved to the event headquarters, where a reception would be held that evening. There was no requirement on the size or number of paintings created. Once she arrived at the headquarters, every artist matted and framed their own canvas. All was complete by late afternoon and ready for the reception. This year, tour headquarters were located at Wildcat Spring Farm in Clarksburg, Maryland. Once the art was displayed, the artists left and a judge was brought in. When the judge’s decisions were made, the artists were invited back. The judge reviewed aspects of each award winner’s art as the winners were revealed. Rebecca had entered the event five times in the past and won first place one time before. This year, she was surprised when her watercolor was selected for first place. “I was shocked!” expressed Rebecca. Rebecca recalled that the judge liked the composition of her watercolor, complementing the pattern of light in the painting, and expressing that it had a finished look. “It was so worth it to put myself out there,” said Rebecca. You can be forgiven if you missed the opening of the new Dollar General Store at 501 E. Main Street in Emmitsburg. The doors opened on June 28, the same day that Emmitsburg Community Heritage Day was being held. Dollar General has more than 12,000 stores in 43 states and is the country’s largest small-box discount retailer by sales. Dollar General anticipates opening 730 new stores in 2015, and plans to remodel or relocate an additional 875 stores. “We offer customers convenience and a mix of products that they use daily,” Menees said. 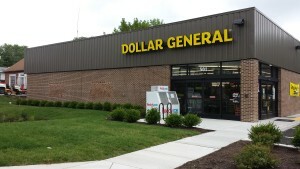 The Emmitsburg Dollar General is a traditional design. It has 7,300 square feet of retail space and 9,100 total square feet. Customers can find frozen foods, household goods, and non-perishable foods. Although the prices are inexpensive, the products aren’t off brands. Menees said that the corporation looked at customer needs, demographic trends, traffic, and competition before deciding on whether or not to build a store in town. Besides offering a new shopping venue for residents of Emmitsburg, it is also creating local employment. 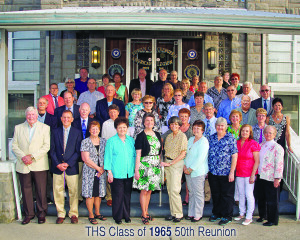 Thurmont High School Class of 1965 celebrated their 50th class reunion on June 5, 2015. A dinner dance was held at the Thurmont American Legion. The seventy-first class to graduate Thurmont High School was comprised of one hundred seventeen students, of which twenty-nine are deceased. Thirty-seven classmates returned to socialize with old friends. Some classmates traveled distances from New Hampshire, Iowa, Utah, Montana, Delaware, and North Carolina. Two teachers were in attendance: Paul Nolan of Thurmont and John Zink of Boonsboro. Pictured from left are: (front row) Paul Nolan (teacher), Robert Zink (teacher), Arlene Glass Fogle, Pat Nunemaker Flohr, Sharon Moser Billones, Virginia Feeser Hanson, Christine Fuss Shriner, Joyce Wolfe Oakes, Marlene Kolb Cook, Nellie Dayhoff Hall; (second row) Gary Shapiro, Dave Stottlemeyer, Rusty Hauver, Doug Fornwald, Carol Shriner Martin, Paula Marshall Garman, Carol Smith Robertson, Darlene Frye Rickerd, Bill Zentz, Carol Royer, Donald Wastler, Vera Jean Bailey Benchoff, Ilene Whipp Weeks; (back row) Gene Eyler, Connie Myers, Richard Weagley, Ronnie Albaugh, Sandra Hauver Wagaman, Jim Stirling, Pauline Ridge Grimes, Carla Zentz Fitz, Mick Strine, Michael Byrne, Carlotta Smith Robertson, Linda Angel Lewis, Carol Anders Riggs, Janie Fox Sharpe, Denny Black, Leah Radeke, Donna Draper Sweeney, Joe Benchoff, Bonnie Blair Johnson, Richard Mathias, Harvey Wetzel. 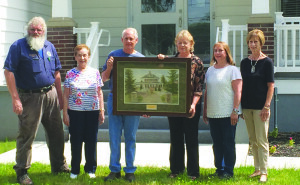 At a recent town meeting, Mayor John Kinnaird announced that the family of former Mayor James Black had donated to the town a framed watercolor print of their family home that was created by local artist Rebecca Pearl. James Black served as Thurmont’s mayor for a period of sixteen years (1969-1977 and 1979-1987). Many may be unaware that the new Thurmont Town Office, located at 615 East Main Street in Thurmont, is also the former home of former Mayor Black and his family. The donated artwork now hangs on the wall behind the commissioners’ desk in the public meeting room in the new Thurmont Town Office. Copies of the print are available for purchase from Rebecca Pearl, 24 W. Main St., Emmitsburg, MD, rebeccapearl123@gmail.com, 301-447-1911. Pictured from left are Mayor John Kinnaird, LaRue Black, Dennis Black, Rebecca Pearl (artist), Susan (Black) Hatter, and Bonnie (Black) Albaugh. Emmitsburg hosted the Cal Ripken 12U 46/60 state tournament from July 2nd to July 7th, for the third consecutive year. Emmitsburg was coming off of back-to-back state titles entering the tournament, and was returning eight players from last year’s championship winning team. With these players and the addition of some new talent, Emmitsburg was optimistic to win its third straight championship in front of the home crowd. On July 2nd, Emmitsburg opened up pool play against UMAC. Emmitsburg had a slow first inning, but Johnny Glass led off the second inning with one of his two homeruns for the game. Glass also dominated on the mound, pitching four innings and allowing just one run on one hit. Bryson Caballero finished the game with two strong innings. Garrett Malachowski cleared the bases on a three-run homerun in the 5th inning, scoring Logan Harrington, Brendan Ott and himself. Lucas Royce, Evan Ott, Johnny Hoffman, and Jayson Howard all had hits as well. Emmitsburg tallied 16 total hits in the opening game, winning 10-1 over UMAC. In the second game of pool play, Emmitsburg played Smithsburg, who was last year’s runner-up in the state tournament. Dylan Click had two hits, including a homerun. Caballero blasted a homerun as well. Malachowski hit another homerun to add on to his hot hitting performance. Caballero pitched four innings and Glass pitched two innings, combining to allow no runs on just three hits. Emmitsburg improved to 2-0 in pool play with the 6-0 win. Frederick was Emmitsburg’s third opponent in pool play. Dylan Click started the game on the mound and pitched two innings of no hit ball. Sean Mazaleski and Garrett Malachowski both pitched two innings as well, each getting four strikeouts. Mason Joy drove in two runs in the 1st inning to put Emmitsburg ahead. Noah Oleszczuk added three more runs in the 2nd inning when he launched a three-run homerun. Malachowski hit a grand-slam homerun in the third inning of the game to make it 9-0. Frederick scored one in the bottom half of the inning to make it 9-1. The score remained 9-1 until the 6th inning when the Ott brothers drew back-to-back walks with the bases loaded to add two more runs. Emmitsburg won 11-1, and improved to 3-0 in pool play. In the last game of pool play, Emmitsburg played Severn. The last time the two teams played against each other was in the 2012 state championship game, where Severn beat Emmitsburg. Emmitsburg has not lost a state tournament game since that loss. The game was a pitching duel, with each team throwing one pitcher the entire game. Emmitsburg’s Bryson Caballero allowed only three hits and struck out nine batters. The deciding factor was an early 1st inning homerun by Emmitsburg’s Noah Oleszczuk. Emmitsburg won the game 1-0 and finished pool play 4-0. Emmitsburg advanced to the title game for the fourth straight year with hopes to win its third straight championship. Severn beat UMAC in the semi-finals to setup a rematch with Emmitsburg. Emmitsburg started Johnny Glass on the mound. Emmitsburg took a one run lead in the 1st inning when Bryson Caballero drove in Dylan Click. Severn scored in the 4th inning on a two-run homerun, which gave Severn the lead 2-1. In the bottom half of the 4th inning, Noah Oleszczuk answered with a two-run shot of his own. This gave Emmitsburg the lead again, 3-2. After a scoreless 5th inning, Severn tied the game on a solo homerun in the top of the 6th. This sent Emmitsburg into the bottom half of the 6th, needing a run to win. Johnny Glass pitched a strong six innings, striking out 12 opposing batters. In the bottom of the 6th, Severn got the first out and needed just two more to force extra innings. As the intensity of the game was building, Emmitsburg’s ninth batter, Logan Harrington stepped up to hit. Harrington is a great base runner with good speed; if he gets on base then Emmitsburg would be in a favorable situation with the top of the order coming up. Harrington, however, made history. He hit a walk-off homerun to send his team to the Middle Atlantic Regional. It was his first homerun of the season, but he saved it for the right moment. Emmitsburg won 4-3 and were state champions for the third consecutive year. At the Middle Atlantic Regional, Emmitsburg opened up pool play against Cumberland County, PA. Johnny Glass had two hits and an RBI. Bryson Caballero and Mason Joy also had hits. Emmitsburg lost 4-3. In the second game of pool play, Emmitsburg played Waynesboro. Dylan Click and Johnny Glass had Emmitsburg’s only hits. Emmitsburg lost 10-0 and dropped to 0-2 in pool play. In day two of regionals, Emmitsburg played Severn, MD in their first game of the day. Dylan Click and Johnny Glass pitched three innings each, holding Severn to just one run. Dylan Click had two hits, including a homerun with two RBIs. Bryson Caballero had four hits with two RBIs. Johnny Glass and Logan Harrington had two RBIs in the game as well. Jayson Howard had a pinch-hit and RBI. Emmitsburg won 10-1 to improve to 1-2 in pool play. In the final game of pool play Emmitsburg played Marlton, NJ. A win would advance Emmitsburg into the quarterfinals. Solid pitching from Johnny Glass, Dylan Click, and Bryson Caballero backed Emmitsburg, as they didn’t allow a run. The game was decided by a lone run, coming from an RBI single from Evan Ott in the second inning. Emmitsburg won 1-0 and finished pool play 2-2, advancing to the quarterfinals as the three seed from their pool. In the quarterfinal, Emmitsburg played Delaware Valley, PA; Delaware Valley was the Pennsylvania state champion. Emmitsburg’s Brendan Ott had a hit and Logan Harrington had two hits. Johnny Glass had a two-run homerun in the third, scoring Emmitsburg’s only runs in a 6-2 loss. Emmitsburg finished a great season, advancing to a regional quarterfinal for the first time in the league’s sixty-year history. Pictured in no particular order: Players Jayson Howard, Garrett Malachowski, Johnny Hoffman, Johnny Glass, Bryson Caballero, Noah Oleszczuk, Evan Ott, Mason Joy, Sean Mazaleski, Logan Harrington, Brendan Ott, Lucas Royce and Dylan Click. Coaches: Dave Wantz, Jimmy Click, John Malachowski, and Jacob Fisher. 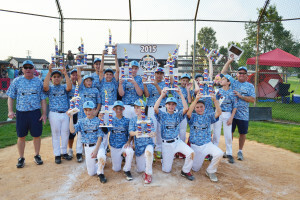 The Thurmont Little League 9-10 All Star Team went 8-0, outscoring their opponents 104-19, to win the Maryland District 2 and Maryland State Championships. With the State Championship, they will be moving on to represent our communities, Maryland District 2, and the State of Maryland in the 9-10 Little League Eastern Regional in Cranston, Rhode Island, from August 8 through August 14, 2015. 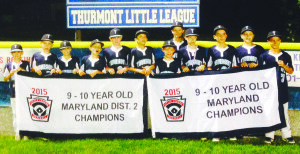 Each year, over eighty Little Leagues from across the state of Maryland compete to call themselves State Champion. In winning the State Championship, Thurmont beat South Caroline 10-2, Berlin 18-7, Marlboro 16-2, and Conococheague 17-5. With this honor comes a great cost to their families to provide the team a chance to compete at the Eastern Regional Tournament. As a result, Thurmont Little League is looking to raise $15,000 to help fund the expenses of the team as they represent the State of Maryland. All donations will go directly to the Thurmont 9-10 All Star team to offset the cost of competition and travel. Donations can be made by going to their website at www.TLLbaseball.com and clicking on the link to donate. These ball players greatly appreciate your donations by Tuesday August 4. Please visit Thurmont Little League’s Facebook page for information and updates on the team’s status during the tournament. The league would like to thank you for giving these talented boys the opportunity to further represent our great communities and the State of Maryland. Pictured from left are: Peyton Castellow, Connor Crum, DJ Shipton, Matt Utermahlen, EJ Lowry, Braden Manning, Braden Bell, Josh Skowronski, Griffin Puvel, Joey McMannis, Will Gisriel, Logan Simanski. Not pictured: Coach Chris Skowronski, Coach Bill Utermahlen, and Manager Tim Castellow. Congratulations Thurmont Little League 9-10’s! 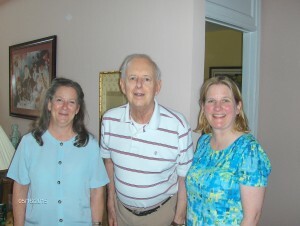 On May 16, 2015, Jim Bittner, Peggy Elgin, and Becky Linton attended an event at Dr. Ronald (Ron) Waynant’s home. They were invited by his wife, Priscilla, for a presentation of a citation awarded him from the President of ASLMS (American Society for Laser Medicine & Surgery, Inc.). In recognition of your dedication and service to the ASLMS and your accomplishments in optical engineering and laser applications for medical devices. Through your inventions, research publications and books, international collaborations as Editor-in-Chief of IEEE Circuits and Devices Magazine, and educator and mentor, you have had a profound influence of the development of energy-based medical devices. I am grateful for your appreciation of the potential of Photobiomodulation and the value and joy you felt with engineers, physicists, and biologists working together. Due to ill health, Ron was unable to attend the 35th Annual Conference of ASLMS in Kissimmee, Florida, in April 2015, so the Presidential Citation was brought to him by Dr. Anders. If you have had a need for a laser medical device, Ron had something to do with making it happen. Ron is the son of Naomi (Martin) and Vaughn Waynant (1916-1978) of Sabillasville. Ron attended Sabillasville Elementary School and Thurmont High School, graduating with the class of 1958. His mother taught at Sabillasville Elementary School from 1931-1971. She passed away in 2012 at the age of 101. Ron Waynant celebrates receiving ASLMS award with his sister, Deb Lego, and his daughter Marcia Patchan. Will there be enough water to survive? Thirsty Land is an exciting new documentary that tells the story of drought, its impact on agriculture, communities, and the global food supply. Two Frederick production companies are collaborating to produce this film. Frederick County filmmaker, Conrad Weaver, is already well-known for his award-winning documentary The Great American Wheat Harvest. His work with farmers and harvesters has led him to turn the focus of his company, Conjostudios LLC, exclusively to agriculture, and now he’s focusing on the drought that’s strangling our landscape. “Those of us living East of the Mississippi River very rarely think about the amount of water we use. That’s why this story needs to be told! The drought in the American West ultimately impacts all of us, and I want to make the audience think about it every time they take a drink of water, enjoy a shower, or water their lawn,” said Weaver. Weaver recently collaborated with Archai Media in Frederick to provide production support for the documentary project. Sam Tressler with Archai Media has taken on the responsibilities of Director of Photography for the film that takes the team across the country from the Central Plains to the Central Valley of California. Weaver is excited to have Archai Media involved, “Tressler’s experience and expertise in shooting in High Resolution 4K is what really made it exciting for me to collaborate with Archai Media. It’s been fun so far to have him along and capturing the story; he’s making my job so much easier,” said Weaver. Production on the project began in April and will continue throughout the summer and fall months. The film is scheduled for completion in spring 2016. Weaver plans on a Frederick premiere screening once the project is completed. To see the film’s trailer, visit www.thirstylandmovie.com. For more interview requests and for more information on the making of the film, contact Conrad Weaver at 301-606-7794 or email conjostudios@gmail.com. 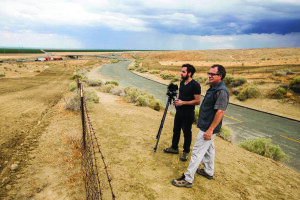 Sam Tressler (left) and Conrad Weaver (right) look over the dry California landscape on a recent trip. Emmitsburg’s Vigilant Hose Company hosted their 7th annual Spring Fling in the parking lot of Mount St. Mary’s University’s Waldron Family Stadium on May 16, 2015. In past years, the event has been described as our community’s version of a party at the beach; this year’s location was described as a community tail-gate party. No matter how you look at it, it’s a good time. During the event, some families host their family reunion; some pre-arrange gatherings of friends; some play cards or table games, others play corn hole, and still others relax and socialize. All the while, ticket jars and raffle drawings take place. The Spring Fling is Vigilant’s main fundraiser during the year. Thousands attend in hopes of winning a large amount of money. The event’s biggest prize award is $4,000, which you do not need to be present to win. This year’s lucky winner of the big jackpot was Warren Zentz. If you were a winner but did not receive your prize on-site, prizes have been mailed. If you did not receive yours, please email Vigilant’s President Tim Clarke at tclarke@vhc6.com. Ticket jar winners are encouraged to visit www.VHC6.org to view a list of winners. If you are a winner of an unclaimed ticket jar, please stop by the firehouse (call ahead at 301-447-2728 to make sure someone is there to help you) to claim your winnings or call Bill Boyd at 717-642-9717. The Vigilant Hose Company would like to thank everyone who purchased a ticket or who volunteered, resulting in another successful Spring Fling. Volunteers work hard to set up and break down the event, gather and transport equipment, hand out food and beverages, sell tickets, and grill chicken. Good job to all! 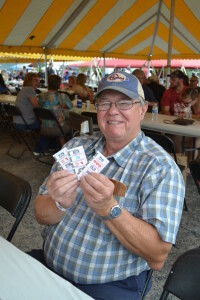 Sam Bigham is shown hoping for a big win at the Vigilant Hose Company’s annual Spring Fling, held on May 16, 2015. 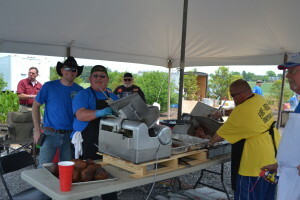 In the tent shown slicing meat are Vance Click, Herb Click, and Ed Wantz. 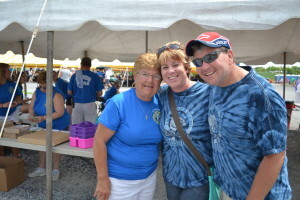 Pictured are Dottie Davis with Shannon and Mike Wetzel.